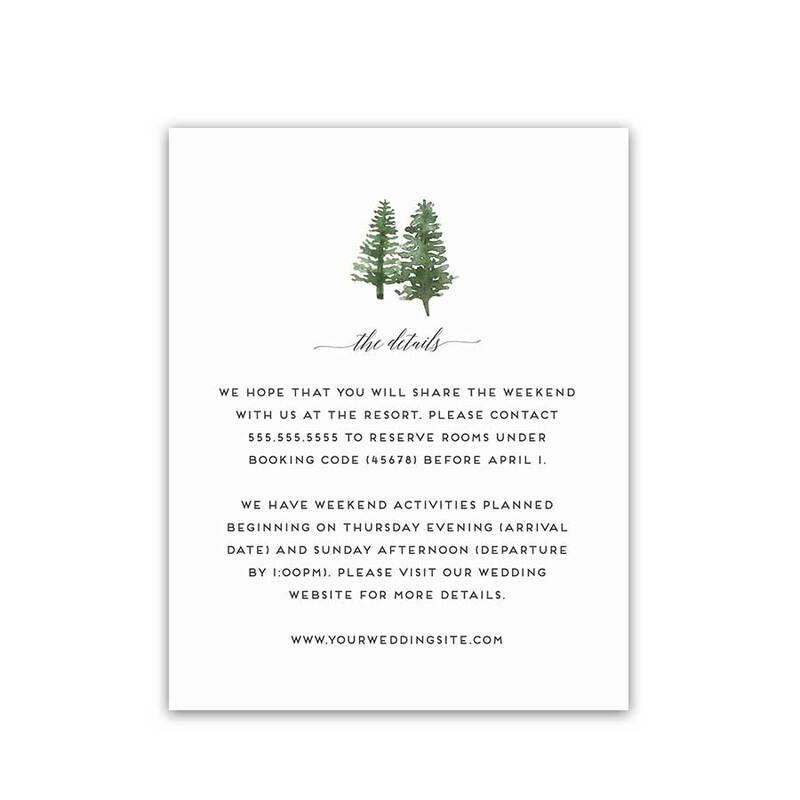 A beautiful outdoor themed wedding thank you card featuring a white background, a pine forest and mountains with modern styled lettering. Thank you cards are printed on our gorgeous Signature paper and envelopes are included. All signature thank you card pricing includes signature paper white or cream envelopes. Please specify your envelope color in the notes to seller. 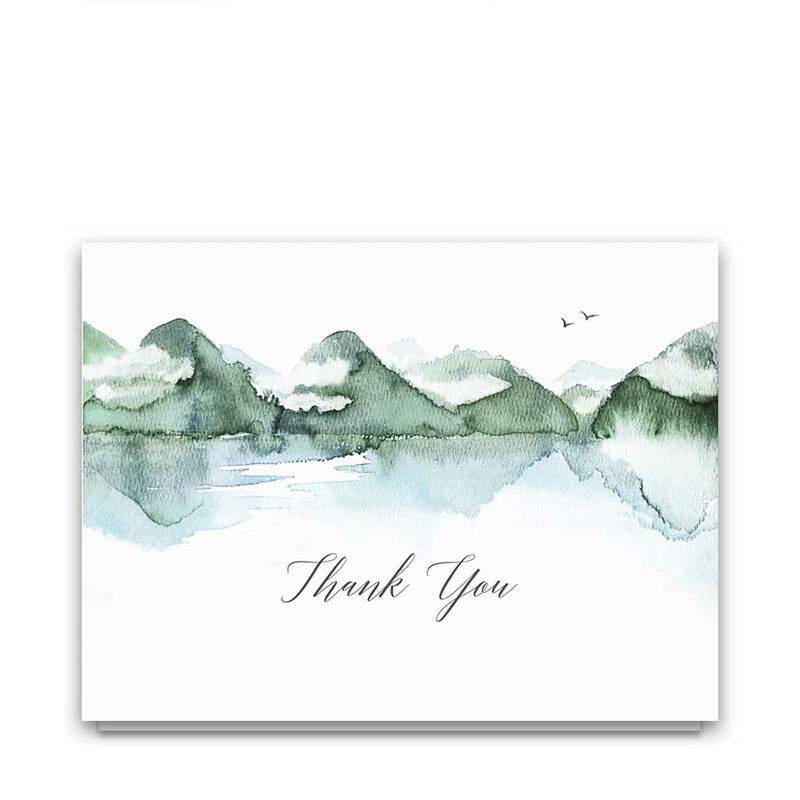 Mountain Thank You Cards Watercolor Forest Lake Scene which features a beautiful mountain scene with a forest at a lakeside. This outdoor wedding thank you card has a white background and modern styled lettering. 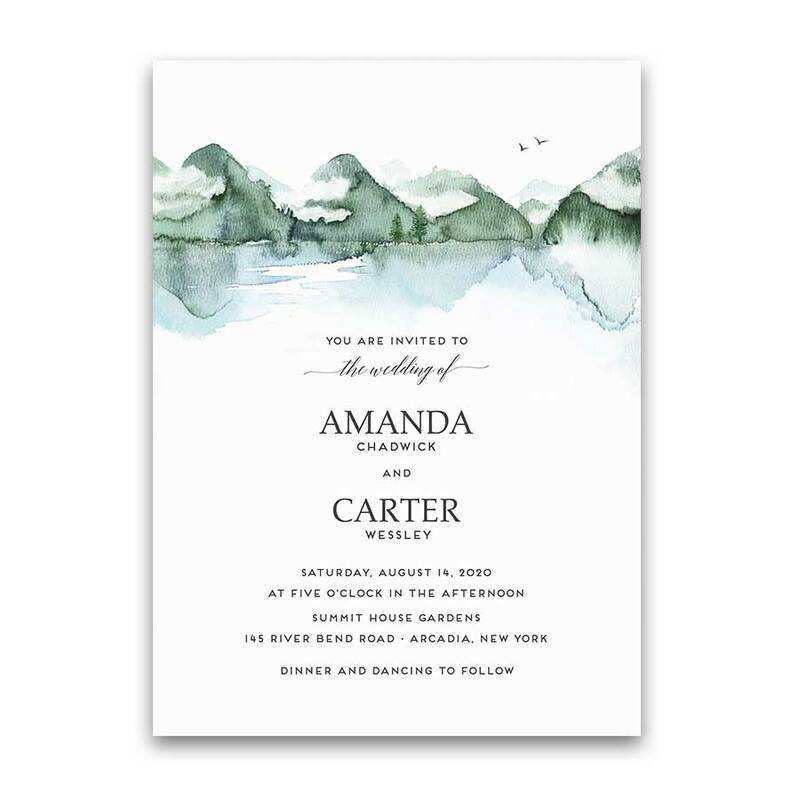 In addition to the watercolor mountain scene, simplicity and style complete the design. 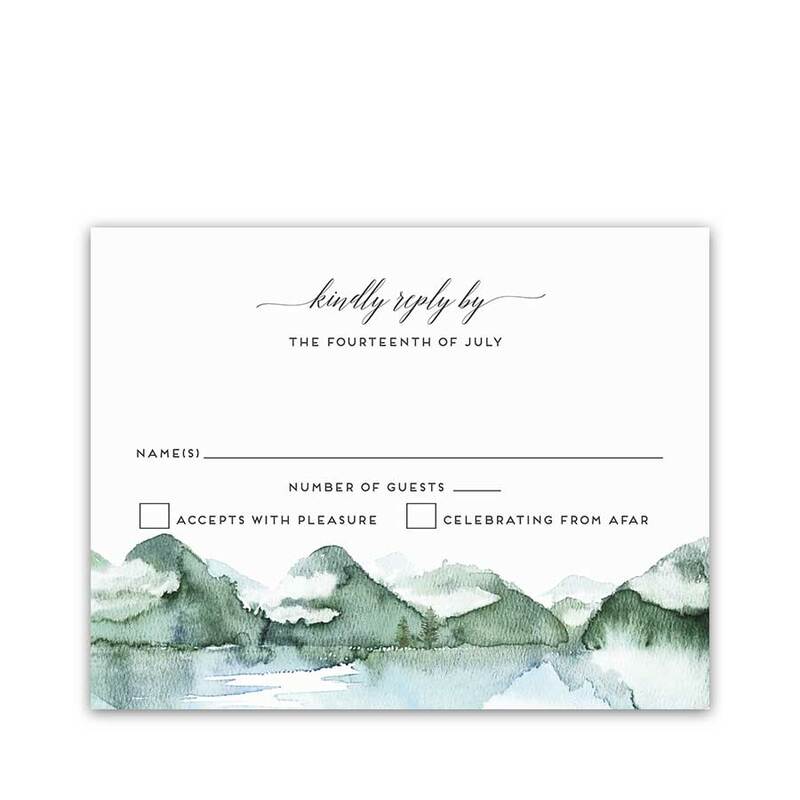 A beautiful wedding thank you card for mountain, forest and outdoor themed themed weddings. A stylish thank you note card which you will use in all of the months of the year. More mountain wedding themed accessories are also available with links to each product below. 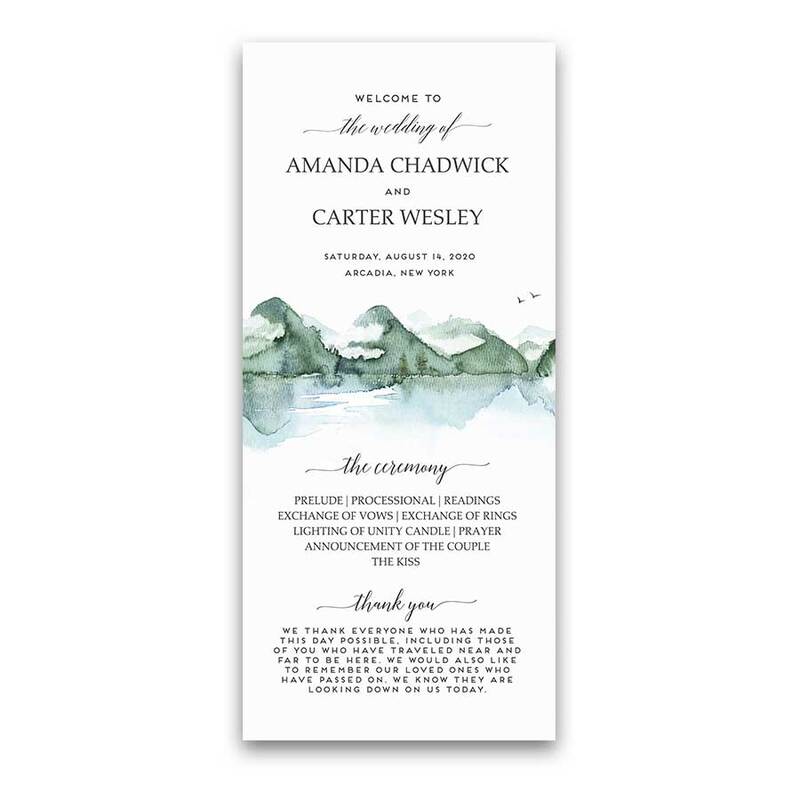 OurMountain Wedding Invitations Template Watercolor Forest Lake collection features beautiful coordinating designs with forest and mountain elements on modern white minimalist backgrounds. Welcome to the Highlands collection – an ode to the beauty of nature. Especially relevant for: glamping weddings, outdoor weddings, mountain weddings and adventure begins themed weddings. Also great for summer weddings and outdoor weddings alike any of the months of spring, or winter. Great examples of wedding thank you card wording can be found on our site. Please feel free to visit our Pinterest Boards for more wedding ideas. TheMountain Thank You Cards Watercolor Forest Lake Scene measure 5.5 inches wide by 4.25 inches long and are folded thank you cards. Printed on our gorgeous signature paper, coordinating envelopes come with each card. In addition, the inside of the card will be white. Coordinating wedding ensemble is also available by clicking the links below- wedding save the date cards and postcards, accommodations and additional details cards, wedding menus, wedding programs, wedding rsvp cards, wedding enclosure cards, thank you cards, place cards and more.